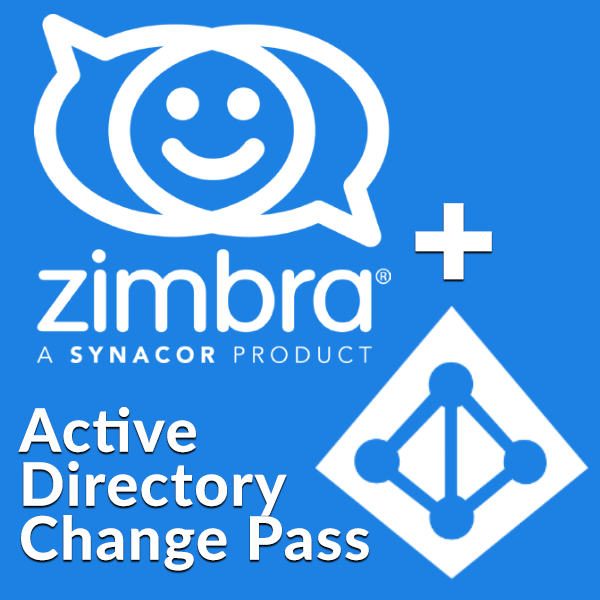 A Zimbra server extension to change Active Directory passwords from the Zimbra web client. The original project by Antonio Messina (a.messina@iknowconsulting.it) https://github.com/xMAnton/ADPassword this version is tested on Zimbra 8.6 and Windows 2012 R2 Active Directory. And Zimbra 8.7 and Windows 2016. The user clicks change password in the Zimbra UI. The extension will find the user's DN in external AD/LDAP based on zimbraAuthLdapSearchFilter in zimbraAuthLdapSearchBase. The extension will not search in case you have set External LDAP account for Authentication. The DN from zimbraAuthLdapExternalDn will then be used. Finally the extension will change the password using bind credentials over a secure connection. If you use the same SSL certificate on your AD as on Zimbra there is a good change you can skip this step. If you already use your AD server for external auth, you can probably skip this as well. If you are not sure, configure your domain to auth against AD first before installing this extension. You can get any ldaps ssl certificate by using OpenSSL: openssl s_client -connect servername:port, copy paste the cert from -----BEGIN CERTIFICATE----- to -----END CERTIFICATE----- and put it in a file on your server. Then import using above commands. zmprov md domain.ext zimbraAuthLdapBindDn "%u@domain.ext"
zmprov md domain.ext zimbraAuthLdapSearchBase "CN=Users,DC=DOMAIN,DC=EXT"
zmprov md domain.ext zimbraAuthLdapSearchBindDn "CN=serviceAccount,CN=Users,DC=DOMAIN,DC=EXT"
zmprov md domain.ext zimbraAuthLdapSearchBindPassword "your-password-here"
zmprov md domain.ext zimbraAuthLdapSearchFilter "(samaccountname=%u)"
zmprov md domain.ext zimbraAuthLdapURL "ldaps://ad-server-ip-or-dns:636"
zmprov md domain.ext zimbraExternalGroupLdapSearchBase "CN=Users,DC=DOMAIN,DC=EXT"
zmprov md domain.ext zimbraExternalGroupLdapSearchFilter "(samaccountname=%u)"
zmprov md domain.ext zimbraAuthMech "ad"
zmprov md domain.ext zimbraAuthMechAdmin "ad"
OU=TestDomain,DC=Test,DC=local as set in the zimbraAuthLdapSearchBase then it will find the user and reset the password. It will say permission denied in the password reset dialog. After debugging the log, i found that it is searching for that user in the search base despite the fact that they are located under another OU under that search base hence why they cannot find the user for password reset. Not sure if there is a way to work around this, but other than that it works great. But, currently i can only use one OU of Users. I also confirmed this by changing the search base to that OU to test what I had thought and it will reset only the users in that search base that is set. That is correct, multiple OU's are not supported.